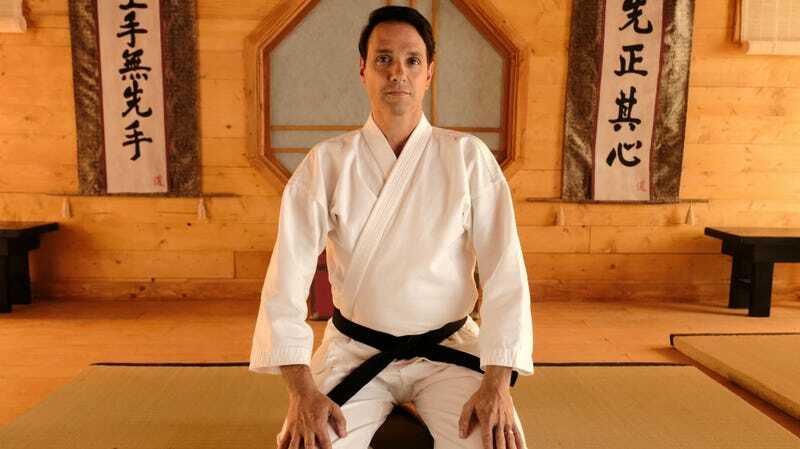 Daniel LaRusso, played by Ralph Macchio, is still preaching the ways of Mr. Miyagi in Cobra Kai season two. Cobra Kai is a sequel to a 35-year-old movie, released as a YouTube TV series, blending nostalgia with heart, parody, and action, starring actors most people hadn’t seen in decades. It had every single right to fail miserably. But, somehow, this follow-up to the ‘80s classic The Karate Kid was a hit, and one of its stars still can’t believe it worked. Season two of Cobra Kai debuts April 24, and it begins with Daniel in a place he’s not used to being: on the losing side. In all three of his Karate Kid movies, Daniel LaRusso triumphed. But in season one of Cobra Kai, Daniel’s student loses to a student from Cobra Kai, the studio run by Daniel’s longtime nemesis, Johnny Lawrence (again played by William Zabka). With Daniel now rising to the full-fledged position of sensei, and Miyagi’s legacy looming large over him, you can imagine season two of Cobra Kai raises the stakes and gets more personal. It almost mirrors a similar arc from The Karate Kid Part II where Daniel and Mr. Miyagi go to Okinawa to face the teacher’s past. Robby (Tanner Buchanan) and Sam (Mary Mouser) are Daniel’s (Ralph Macchio) new pupils in Cobra Kai season two. Kreese, played by Martin Kove, was the Cobra Kai sensei from the original Karate Kid trilogy who made a shocking return as a cliffhanger at the end of Cobra Kai season one. His return will pose complications for both Johnny and Daniel, but it remains to be seen if those problems will be embraced in the same way issues in season one were. That whole scenario holds a special place in Macchio’s heart, no matter what happens moving ahead. Much like Johnny and Daniel, Cobra Kai has a lot going on below the surface. If you haven’t watched it and only know it a “the Karate Kid YouTube show,” sure, it can seem kind of silly. But the way each episode pays tribute to a classic movie should continue to delight fans and non-fans alike. Now they just have to do it again. Cobra Kai returns to YouTube Premium April 24. We’ll have more for you then regarding Macchio’s reaction to the events in season two but for now, here’s the new trailer.